The state legislative session ended yesterday, and unfortunately, our elected “leaders” appear to have simply kicked the large, growing budget deficit down the road. When next year rolls around, be ready for HUGE tax increases and/or cuts in government services. Proposals from our “streamline commission” members, like Treasurer John Kennedy, to phase out 15,000 state jobs over the next 3 years, went unconsidered, and therefore, the taxpayers will continue to bear the burden of too many state government jobs and salaries. HB 519 by Rep. Page Cortez (R-Lafayette) – This legislation passed both the House and Senate, should become law, and will reform the Teachers’ Retirement System (retire/re-hire program) by stating that those in the system who retire then are re-hired at another position CANNOT receive both retirement benefits and their new salary unless their re-hiring sends them back into the classroom to teach subjects of need. The retire/re-hire program has been abused, costing the taxpayers tens of millions, over the past years. This bill will hopefully close the loopholes for such abuse. SB 407 by Sen. Joe McPherson (D-Woodworth) – Repealed the $15 fee increase on state drivers’ liscenses. The Jindal Administration argued the fee increase, which would have provided an extra $13 Million per year, was needed to fund state police salaries and services. However, some legislators and other state government researchers discovered that an increase of that amount was not needed for the reasons the Administration specified. Such information fueled the anti-tax/fee increase fires, especially since distrust of federal/state/local governments is already pretty high in the current political climate. Hopefully the passing of this legislation will at least send a message to politicians that if they’re going to ask for more of our earned income, the process needs to based on honesty and transparency. Defeat of Pro-Violent Criminal Bills – HB 194 by Rep. Patricia Smith (D-Baton Rouge) decreased the amount of sentence VIOLENT offenders would have to serve before being eligible for parole. The normally more conservative House passed the bill, but fortunately, the measure overwhelmingly failed in two floor attemps to pass the Senate. SB 494 and 621 by Sen. Danny Martiny (R-Metairie) would have provided for parole eligibility for convicted violent criminals, including murders and rapists, upon reaching the age of 45, and in the case of SB 621, after having served only 15 years in prison. SB 621, which dealt with the Habitual Offenders Law, was amendment to exclude convicted violent offenders from eligibility. SB 494 was defeated on the Senate floor. 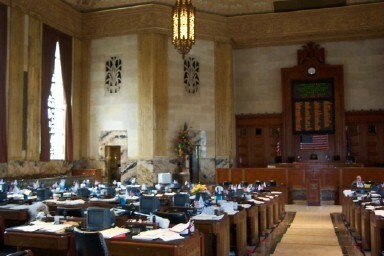 HB 276 by Rep. Walt Leger (D-New Orleans) – This legislation, which will be on the ballot as a Constitutional Amendment this Fall since it passed the House and Senate, seeks to repeal certain protections for individual property rights. Louisiana voters overwhelmingly elected to install such protections with a Const. Amendment back in 2006, however, Rep. Leger and others are now seeking to take those rights back away from individual property owners. The debate was framed as trying to help clean up abandoned properties in New Orleans, however, this legislation goes too far in repealing necessary individual rights, plus it applies to the ENTIRE state, not just New Orleans. Those wanting to protect their property rights should go to the polls in the Fall and vote AGAINST this Constitutional Amendment. HB 224 by Rep. Pearson (R-Slidell) – This was a GOOD bill, seeking to prohibit public officials/employees convicted of a felony relating to their public job from receiving retirement benefits during their time of incarceration. Such legislation seemed to make perfect sense, unfortunately, it FAILED House passage 42-56. HB 1 (Budget Bill) & HB 76 – The taxpayers were taken for a ride the past 3 days regarding the budget bill and legislative pet projects. The House passed the budget bill with a little over $24 Billion in expenditures, using some large portions of one-time revenues to plug re-occurring expenses, which included around $12 million in amendments to fund non-state government organizations and projects, ie. legislative slush projects. However, the Senate wanted to add in an extra $1.8 Billion to put the budget over $26 Billion, and tap into more emergency funds. The House appeared to object, so the Senate removed the pet project amendments and then passed the bill back to the House. The Senate promised to put the pet projects into another House bill, HB 76, only if the House voted to concur in Senate amendments. The Governor urged the House Sunday to agree to this fiscally irresponsible blackmail, and 69 House members folded and agreed. Basically, 69 of our House members agreed to this irresponsible $1.8 Billion budget increase to save $12 Million in pet legislative projects. The Senate then, with no opposition, tacked the $12 Million in legislative projects onto HB 76, and also added another $13 Million in similar project appropriations of their own. HB 76 went to the House to concur, and the voice of reason who took to the floor to speak out against this irresponsible budget process was far liberal French Quarter Representative Juan LaFonta (D-New Orleans)! Rep. LaFonta motioned to reject the Senate amendments, citing it was poor leadership to fund the pet projects while cutting from Higher Education and health care. Only 24 House Reps. voted with LaFonta. Then, only 15 House Reps. voted NO on concurring in Sen. amendments. Please follow how your elected Representatives and Senators voted on these and other important issues. We need to stay informed on how our elected leaders vote and operate. Nick Bouterie is a conservative activist living in Iota, LA.